May 7, 2019 4:30 p.m.
Thursday, May 23: 10:00 a.m. - Noon - Winnipeg Police Service: Personal Safety for Seniors - Fireside Room, Robert A. Steen Community Centre, 980 Palmerston Ave. Free. 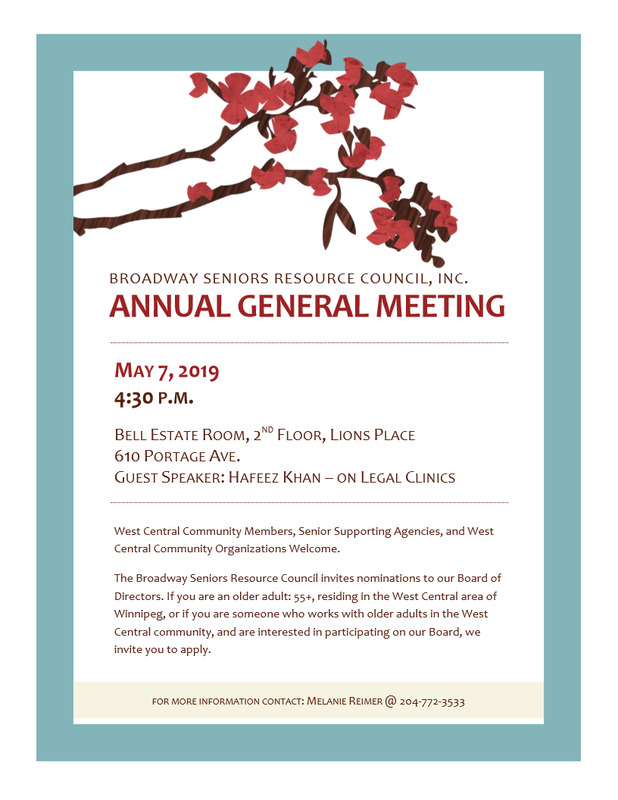 Thursday, June 20: 10:00 a.m. - Noon - Broadway Seniors Resource Council: World Elder Abuse Awareness Day Presentation of "It's Not Right! Neighbours, Friends & Families for Older Adults -Fireside Room, Robert A. Steen Community Centre. Free. Monday, March 18: 11:00 a.m. - 7:30 p.m.
Tuesday, March 19: 11:00 a.m. - 7:30 p.m.
Wednesday, March 20: 11:00 a.m. - 7:30 p.m.
Thursday, March 21: 11:00 a.m. - 7:30 p.m.
Friday, March 22: 11:00 a.m. - 3:00 p.m.
Saturday, March 23: 11:00 a.m. - 3:00 p.m. The Community Volunteer Income Tax Program provides volunteers to prepare income tax returns for individuals with a modest income and a simple tax situation. Drop-in only. First come, forst served on the day. Learn more about free volunteer Tax Preparation Clinics at www.cra-arc.gc.ca/volunteer Call 204-986-6450 for more details. Daniel McIntyre/St. Matthew's Community Association - 823 Ellice Ave. at Arlington. Wednesdays and Thursdays from 1:00 p.m. - 4:00 p.m. First come, first served. African Communities of Manitoba Inc. - 101-421 Kennedy St. Monday - Friday: 1:00 p.m. - 7:00 p.m. March 1st - April 30. Closed March 5th. Walk-in. Will prepare current and prior years. Community Financial Counselling Services - 401 York Ave. (Norquay Building) Located in the basement auditorium. Every Tuesday, Wednesday, Thursday & Friday: 9:00 a.m. - 3:00 p.m. February 26 - March 31. Closed during holidays. Monday - Friday: 9:00 a.m. - 3:00 p.m. April 1 - April 30. Closed during holidays. Does not serve clients who exceed suggested income. First come, first served. Client must provide all tax slips and receipts. Use main/front entrance. Altered Minds Inc. - 400-259 Portage Ave. Monday - Friday: 9:00 a.m. - 8:00 p.m. February 20 - March 29. Closed during holidays. By appointment only. Current year only. Call Sarah at 204-944-0133 or Albina at 204-944-1404 to book your appointment. Broadway-First Baptist Church - 790 Honeyman Ave.
Every Tuesday: 12:30 p.m. - 3:30 p.m. February 26 - April 23. Every Thursday: 6:30 p.m. - 8:45 p.m. February 28 - April 25. Every Sunday: 1:00 p.m. - 2:45 p.m. March 10 - April 7. Call Monday - Friday between 10:00 a.m. - 4:00 p.m. to make appointments. Enter through Walnut Street entrance, buzzer is located on right side of doors. Current and prior years. Call 204-293-8224 to book your appointment. New Journey Housing - 200-305 Broadway. Beginning in March. By appointment or drop-off services only. Contact 204-942-2238 for dates/times. Society for Manitobans with Disabilities - 204-825 Sherbrook St. Monday - Friday: 9:00 a.m. - 2:30 p.m. March 12 - May 1. By appointment only. For persons living with a disability. Drop-offs if arranged ahead of time. Bring ID and all receipts. Current and prior years. St. James Assiniboia 55+ Centre - 3-203 Duffield St. Monday, March 18: 5:30 p.m. - 8:00 p.m. To qualify, gross annual income must not exceed $35,000 (single) / $45,000 (couple). Call A&O Support Services for Older Adults to book an appointment at 204-956-6440. Wednesday, April 24: 10:00 a.m. - 1:00 p.m. - Learn about Legal Help Centre - Main Floor, Millennium Library, 251 Donald St. Free. Drop in to talk with staff of Legal Help Centre to learn how they provide free legal information, summary advice and referrals to helpful resources. 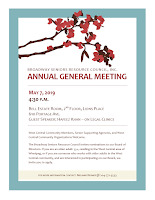 Saturday, April 27: 2:30 p.m. - Spring Ring 2019 - Broadway-First Baptist Church, 790 Honeyman Ave. @ Walnut St. Everyone welcome! Admission by donation. Hosted by the Manitoba Guild of English Handbell Ringers, featuring Manitoba Handbell Choirs. For more information contact 204-735-2423 or 204-269-0208. Wednesday, May 1: 1:00 p.m. - 4:00 p.m. - Spring Health Fair - Good Neighbours Active Living Centre, 720 Henderson Hwy. Free. Good Neighbours Active Living Centre and the Healthy Aging Resource Team host this resource fair which will provide a variety of health service booths and a "Cannabis 101" panel presentation from 2:30 p.m. - 3:30 p.m. For more information call 204-669-1710. Thursday, May 2: 9:00 a.m. - Oral Health Education & Screening Event - St. James Assiniboia 55+ Centre, 3-203 Duffield St. 9:00 a.m. - 10:00 a.m. Education Session and Oral Health Presentation followed by FREE Oral Screenings. Must attend presentation to be eligible for a free (15 minute) one-on-one Oral Health Screening with a Registered Dental Hygienist. *Low income seniors/seniors unable to access regular dental services may be eligible for additional free dental service (up to a maximum of $160) at a cost to the client of only $20 (payment of $20 due following screening)* Pre-book screening appointments by calling the St. James Assiniboia 55+ Centre at 204-987-8850. For more information please contact Healthy Aging Resource Team at 204-940-3261. Home Routes - R.A. Steen Community Centre Folk Jam - Wednesdays, 1:30 p.m. - 3:00 p.m. (March 6 - 27) - Robert A. Steen Community Centre, 980 Palmerston Ave. Cost: $40. Maybe it's finally time to dust off that old instrument you've always meant to get at, or take the plunge and try to play that instrument you've always wished you had. If this is you, then the Home Routes - R.A. Steen Folk Jam is the perfect place to do it. Each class is lead by a professional Home Routes musician who will guide the class through a rewarding journey of learning to play and jam in a group. The emphasis of this class is fun and we aim to take joy in the process of learning together. All instruments wlcome. A limit number of instruments will be available for use on site. Please email us if you don't have an instrument to use. We do our best to help you. (Email: workshops@homeroutes.ca) The fist 30 minutes of every session will be devoted to teaching and coaching. The remaining hour will be spent playing songs together. Contact Paula at 204-783-5616 to register. Pickleball - Wednesdays, 10:00 a.m. - Noon (April 3 - June 5) - Robert A. Steen Community Centre, 980 Palmerston Ave. Cost: $65. Pickleball is a paddle sport that combines elements of badminton, tennis, and table tennis. Two or four players use solid paddles made of wood or composite materials to hit a perforated ball, similar to a Wiffle Ball, over a net. For more information or to register contact Paula at 204-783-5616. It's All About Us - Wednesdays, 9:30 a.m. - 11:30 a.m. - Bell Estate Room, Lions Place. A confidential group for older adults who are thinking about, or getting ready to reduce or stop their use of alcohol, sedatives, pain killers or gambling, or are looking for ongoing support to maintain recovery with addiction, anxiety and depression. Led by peer facilitators. Please call Melanie Reimer at 204-772-3533 for more information. Stress Busters - Tuesdays: 1:00 p.m. - 3:00 p.m. - DMSMCA, 823 Ellice Ave. A support group for those 55+ experiencing on-going or episodic periods of isolation or stress. The setting is informal, so drop by for a coffee and to meet other seniors. Note: The group will not be meeting April 16 & 23. Contact Laurel at 204-774-7005 for more information. Good Food Club: Healthy Seniors & Friends Group Meetings. Every second Tuesday of every month, 1:30 p.m. - 2:30 p.m. - Second level boardroom, 545 Broadway. Elevator available. Free. Join us to: meet new people in your community, learn about senior-specific resources and events to attend, provide feedback and new ideas for programming needed in your area, learn about volunteer opportunities, enjoy a snack with others, and more! For more information, call Ailene or Danielle at 204-774-7201 ext. 6. Art Classes 45+ Programming - Wednesdays, 12:30 p.m. - 2:30 p.m. - Common Room at St. Matthews Maryland Community Ministry, 365 McGee St. Free and fun art programming, facilitated by an instructor from Art City. Healthy snacks provided. No experience required! Seniors Health & Wellness 45+ Program - Fridays, 11:00 a.m. - 1:00 p.m. - Common Room at St. Matthews Maryland Community Ministry, 365 McGee St. Free. Led by experienced health and wellness facilitators. Each week will feature light physical activity (yoga, dance, stretching, walking, gardening), healthy snacks, and information on nutrition, diet and mental health. Each month we will go on one field trip outside of the building. Over the Rainbow - Rainbow Resource Centre - 170 Scott St. A Rainbow Resource Centre social support group for the 55+ LGBT2SQ+ folks in Winnipeg and surrounding areas. Coffee & Chat - Drop-in for coffee, tea, and conversation on the first and third Thursday of every month, from 10:00 a.m. - Noon. Potluck Supper - Bring some food to share on the second Thursday of every month, from 6:00 p.m. - 8:00 p.m.
Movie Matinée - Stop by on the fourth Thursday of every month from 1:30 p.m. - 4:30 p.m. for popcorn and a show. For more information, visit www.rainbowresourcecentre.org or contact the Program Coordinator, 204-474-0212, ext. 204.